We’d love your help. Let us know what’s wrong with this preview of Different by Youngme Moon. To ask other readers questions about Different, please sign up. Thought provoking book. At first, I was frustrated because the author explains upfront that this won't be like other business books. No tidy takeaways and key action points. You have to slow down and let her walk you through her thinking. She's so eloquent, though, that once you do this, she does a brilliant job of coming at key points from surprising directions. The sign of a good book is one that stays with you and/or one you want to discuss with others and Different scored on both fronts. I e Thought provoking book. At first, I was frustrated because the author explains upfront that this won't be like other business books. No tidy takeaways and key action points. You have to slow down and let her walk you through her thinking. She's so eloquent, though, that once you do this, she does a brilliant job of coming at key points from surprising directions. The sign of a good book is one that stays with you and/or one you want to discuss with others and Different scored on both fronts. I ended up reading segments from this to my husband on a drive back from a weekend away and we both enjoyed her analysis of how some household brands had successfully - and surprisingly - achieved the status of Different. Liked it. A somewhat philosophical take on what it means to be different. I believe the author was a business professor so the context of the book was in the business world (e.g. why/how Ikea or a couple of other brands are considered differnet). Easy business read. I enjoyed the ideas and the way she writes but classic example of a book that was probably a magazine article or bschool case study that someone stretched to sell as a book. An insightful, nuanced, atypical "business" book. Usually business books are popular in their target audience because they offer actionable golden bullets: "do these 1, 2, 3 steps and you can succeed." This book intentionally eschews that route. It is not about "how" a business becomes "different," but rather, simply about describing cases of businesses that have really stood out for being different in one way or another. There are cases on Google, Ikea, Apple, Harley Davidson, etc. These compan An insightful, nuanced, atypical "business" book. Usually business books are popular in their target audience because they offer actionable golden bullets: "do these 1, 2, 3 steps and you can succeed." This book intentionally eschews that route. It is not about "how" a business becomes "different," but rather, simply about describing cases of businesses that have really stood out for being different in one way or another. There are cases on Google, Ikea, Apple, Harley Davidson, etc. These companies bite off more than they can chew and have become icons. The question is how they got there but the answer in each case is, unsurprisingly, different. Google gave us a more streamlined search when the industry trend was moving towards all-in-one portals. Ikea gave us an antithetical (build it all yourself furniture that doesn't last that long) value proposition for furniture stores. Interesting. Informative. Well written. Two of my favorite brands are profiled in the book: Ikea and In-N-Out Burger. While the author is addressing larger businesses and their product marketing efforts, I chose to read this to see how some of the concepts could be applied to indie art/craft businesses (which, in recent years, seem to be adopting the same marketing strategies as regular "brands" ... to their detriment, IMHO). Nice to see big brands that do it their own way and find success! A true must read for everyone involved with marketing. This book was about business and I liked how it was unique because unlike other business books I gave up on in the first page this was more interesting. I liked how it gave lots of examples starting from Jet Blue to Harley-Davidson. It talked about the benefits of being different as a company. It said the three types of different businesses were hostile brands, reversed brands and breakaway brands. Decent read for those digging into positioning and differentiation. I'd put this at 3.5 stars. There are some good examples throughout. During the first read, it didn't come across as heavily research-backed, but rather as the perspective of a qualified educator. Whether that's good or bad or neutral depends on what you're looking for. This book had some interesting points, but it felt like the author had a need to fill space and added a lot of unnecessary rambling. She is unapologetic for her style in the intro, which is kind of a mishmash of thoughts. I could deal with that, but the book probably could have been about 100 pages instead of 200+. I liked the general manifesto, but the book didn't really have enough depth. I didn't finish reading it feeling armed with great case studies or facts. I also found the references to the author's own family / children / students a bit off putting. Fantastic. Simply one of the best business books I've read in years. - a proliferação de uma categoria de produtos( hipercompetitivas) começa a gerar cada vez menos diferenças entre os produtos/ marcas. Os diferenciais são imperceptíveis para o consumidor. - conhecimento profundo anda lado a lado com a devoção, sentimos afinidade pela categoria de produtos, viramos aficcionados e ai pode haver um momento de maturação de uma categoria onde começamos a nos alienar pelas diferenças e a categoria entra em expiral. - homogeneidade heterogênica - as diferenças existem ma - a proliferação de uma categoria de produtos( hipercompetitivas) começa a gerar cada vez menos diferenças entre os produtos/ marcas. Os diferenciais são imperceptíveis para o consumidor. - homogeneidade heterogênica - as diferenças existem mas são imperceptíveis. - o ato de se medir alguma coisa ( atributos de produto) muda o comportamento da coisa que esta sendo medida. Tudo vai ficando igual pois as empresam tendem a buscar o gap na pesquisa e no final todas marcas oferecem o mesmo nível de atributos( homogeneização gradual da oferta) ex atributos carros audi x volvo. - quando se compara 2 pessoas ou marcas tendemos a atenuar as diferenças ao inves de acentualas, o que cria a homogeneidade. Este processo de aperfeiçoamento ( melhoria incremental) que dita a regra das empresas como proposta de valor é um caminho para a comoditização. Ao longo do tempo quanto mais generosa for a proposta de valor padrão ( ex carro com ar e airbag) dentro de uma categoria menos fiel o consumidor é a uma marca pois a categoria fica comoditizada. - quando existe uma multiplicação de marcas competindo em múltiplos subsegmentos, essa supercompetição leva o consumidor a perder interesse na categoria pois tudo fica muito complexo e n estamos dispostos a investir tempo nisso ( ex modelos de calça jeans e processadores de computadores). E como consequencia quando a categoria fica hipercompetitiva tendemos a começar a nos relacionar com a categoria e não com a marca. Nem melhor nem pior e sim diferente, ser reconhecida por ser a marca das idéias e refazem totalmente a proposta de valor da categoria, um rebelde com causa. Temos a tendência a achar que a história avança em uma serie da passos cumulativos, que progresso é sinônimo de andar para frente. Podemos avançar com subtrações na oferta . Menos é mais quando o mais virou comoditty. Toda essa comoditização nos leva a uma apatia mental, nada nos faz sair do automático no consumo. A mesmice no mundo dos negócios ocorre nao pq as empresas cooperam e sim pq elas competem sempre nas mesmas dimensões. Só existe corrida se todos forem para a mesmo lado. Nao é necessário fazer mais e sim pensar mais no que fazer. Marcas de idéia oferece excasses de um beneficio na abundância de mesmice. A diferenciação é um compromisso com abandonar o comum. 1. Reverse brands, which go in the opposite directions of feature 'augmentation' trends in their category (e.g., how Google embraced a clean interface while all other search engines crammed more links into the homepage). Some brands, like Apple do a little bit of all 3. Beyond that, I liked Moon's generalized consumer segmentation - basically that every category has five groups: connoisseurs, opportunists, pragmatics, reluctants, and brand loyalists. When I used to work for a company that did these sorts of segmentations, I sometimes wondered if our clients knew how similar the results and strategies that we recommended to them were to what we recommended to everyone else... so was interesting to read that most categories are actually pretty similar. On the downside, there was hardly any numerical evidence to back up the observations Moon was making - no validation with consumers research, no breakdowns of market share and brand proliferation over time. There was an occasional "quote" of a social media post from a consumer somewhere, but the fact that it was not attributed and was not in screenshot form, made me wonder if Moon just made up the quotes to drive home her point. I really wanted to like this book, and to some extent I did. But I also found it extremely frustrating. All to say, there are some real pros and cons to this book. It's really more of a beach read than academic. - The examples are cherry picked and the analysis of their impact entirely post-hoc. It is far from scientific. There are no examples 2.5 stars. - The examples are cherry picked and the analysis of their impact entirely post-hoc. It is far from scientific. There are no examples of companies that tried to be "different," but failed. - It reads more like a book proposal than a stand alone book. This was very good. Lots of food for thought here. I've had a long-running love-hate relationship with Sinek's Start With Why. It's not that I think he's wrong, I just feel that it's not complete. This book, in my opinion, does a better (broader and more thorough) job of describing what makes successful companies successful... and spoiler alert: it's not just an inspirational internal mission statement. Not the best business book I've read and not the worst. I may or may not have read this befor This was very good. Lots of food for thought here. I never thought I would enjoy reading a marketing book until I read this. It was quite boring at first, but when she started to mention case studies, it successfully sparked my interest. Through this book, I am now pretty much understand marketing techniques such as augmentation by addition, augmentation by multiplication, reversed positioning, and so forth. And I got to appreciate my Birkenstock sandals even more since it is one of the most badass or using the author's term, hostile brands. "The I never thought I would enjoy reading a marketing book until I read this. It was quite boring at first, but when she started to mention case studies, it successfully sparked my interest. Through this book, I am now pretty much understand marketing techniques such as augmentation by addition, augmentation by multiplication, reversed positioning, and so forth. And I got to appreciate my Birkenstock sandals even more since it is one of the most badass or using the author's term, hostile brands. One of my all-time favourites for now. The book dives into the world of brands and how we have so much choice in brands, that it becomes harder and harder to differentiate. She offers a couple of models and theories to work with and describes some great examples how companies truly differentiate from one another. Not through added features like washing soap with more rinsing power (augmentation or something), but through doing something actually different. Will read this over and over. Moon is of great insight of how competition eventually leads to less product differentiation. The book gives a few novel ideas to escape competition dilemma. The last two chapters however are redundant to me. It would be better to put them in an epilogue. Saying a great thing and a good thing is less charming then saying a great thing only. Overall, it refreshes the mindsets in marketing and product design. I really loved this book! It was a fascinating collection of case studies on different businesses, and I thought that Moon explained the marketing and ideas behind each brand in a very interesting way. All in all, a great analysis of larger societal trends in marketing and the companies that stand out. I read this book for class and was very impressed by the information Moon described. The way the book is told is different because it is almost told through story. There are an immense amount of real life examples that help bring the ideas home. I truly enjoyed reading how you can differentiate your business in various ways. I recommend this book to any marketing person. Youngme does a terrific job of helping you understand what “different” means and that working to be “better” is, on your best day, a losing battle. It was a bit too conceptual, but the summary of the top 3 contexts for brands of the future creates simple clarity. As a natural contrarian, I loved the ideas of the book. The higher the competition, the higher the homogenization. Thus, to be special, one must be different. The book offers a few categories of different. Again, I very much liked the ideas. If you like to know more about ingenious marketing campaigns of world-known brands, learn counter-intuitive marketing strategies and how they harness human psychology this book is the right choice for you. 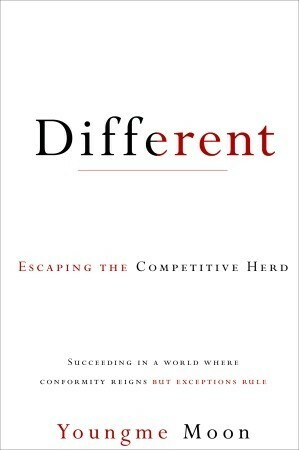 This book well raised the awareness of the importance of being different but if you are looking for a method to differentiate your self, you might not find the answer from the book. However, studies that Moon referred in the appendix page are worth reading! Rich branding examples put in very simple words. Another book by another Harvard professor and what a disappointment. Same old unconventional marketing insight fluff. Good perspective on differentiation, and what it takes to make an impact in a world full of clutter.